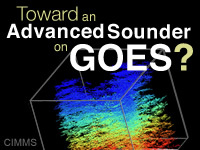 MetEd » Resource Description: Toward an Advanced Sounder on GOES? This module uses recorded interviews from several satellite meteorologists and respected satellite experts to describe how a high spectral resolution infrared sounder in geostationary orbit would lead to significant improvements in mesoscale and severe weather forecasting and numerical weather prediction. Discussions focus on the currently unsatisfied need for an advanced sounder in geostationary orbit and the potential contributions this capability could provide. Typically, MetEd lessons are based on facts. This lesson should be drastically improved, or removed all together. The opinions of a select few people in the same field is not educational, its debatable, and I did not intend to take a speech lesson. * Recall what the GOES-R ABI will offer in terms of continuity of current sounder products. * Compare the current GOES sounder to current hyperspectral sounders on polar-orbiting satellites and advanced sounders for future geostationary satellites.